– Le 24 avril 2016 Writings. Les textes de Jean-Marie Straub et Danièle Huillet, édités par Sally Shafto en collaboration avec Katherine Pickard, paraîtront chez Sequence Press. Le volume est revu et augmenté par rapport aux éditions antérieures en espagnol et en français. – Le 6 mai 2016 inauguration de la rétrospective itinérante 2016-2017 au Museum of Modern Art à New York. Dans la programmation de Josh Siegel, l’intégralité de l’œuvre des 46 films y sera présentée du 6 mai au 5 juin. Parution de Jean-Marie Straub and Danièle Huillet, édité par Ted Fendt et publié chez FilmmuseumSynemaPublikationen. Distribution internationale: Columbia University Press New York. Après New York, la rétrospective circulera à travers les États-Unis et le Canada. La clôture aura lieu à Toronto, au printemps 2017. Le tour continuera ensuite dans l’espace anglophone européen et mondial. Organisation : Thomas Beard, Light Industry à Brooklyn, qui nous donnera des détails prochainement. Der Brautigam, die Komodiantin und der Zuhalter. Othon or Eyes Do Not Want to Close at All Times, or, Perhaps One Day Rome will Permit Herself to Choose in her Turn. Toute Révolution est un coup de dés. Directed by Daniele Huillet and Jean-Marie Straub. With Erich Kuby, Renate Lang, Guenther Strupp. West Germany 1963, 35mm, b/w, 19 min. German with English subtitles. Directed by Jean-Marie Straub. With Heinrich Hargesheimer, Carlheinz Hargesheimer, Martha Staendner. West Germany 1965, 35mm, b/w, 55 min. German with English subtitles. Directed by Jean-Marie Straub. With Irm Hermann, Kristin Peterson, Hanna Schygulla. West Germany 1968, 35mm, b/w, 23 min. German with English subtitles. Directed by Daniele Huillet and Jean-Marie Straub. France/Egypt 1982, 16mm, color, b/w, 100 min. German, French, Arabic with English subtitles. Directed by Daniele Huillet and Jean-Marie Straub. With Olimpia Carlisi, Guido Lombardi, Gino Felici. Italy/West Germany 1979, 35mm, color, 105 min. Italian, Dutch, French, German with English subtitles. Directed by Daniele Huillet, Jean-Marie Straub. Italy/France 1977, 16mm, color & b/w, 83 min. Italian and Hebrew with English subtitles. Directed by Daniele Huillet and Jean-Marie Straub. With Daniele Huillet, Helmut Farber, Michel Delahaye. France 1977, 35mm, color, 10 min. French with English subtitles. Directed by Daniele Huillet and Jean-Marie Straub. With Astrid Ofner, Ursula Ofner, Libgart Schwa rz. Germany/France 1991, 35mm, color, 100 min. German with English subtitles. Italy/West Germany 1972, 16mm, color, 85 min. German with English subtitles. Directed by Daniele Huillet and Jean-Marie Straub. With Oliver Straub, Nadette Thinus, Bernard Thinus. France 1982, 35mm, b/w, 7 min. French with English subtitles. West Germany/Italy 1969, 16mm, color, 88 min. French with English subtitles. Directed by Daniele Huillet and Jean-Marie Straub. With Gunter Reich, Louis Devos, Eva Csapo. West Germany 1974, 35mm, color, 105 min. German with English subtitles. West Germany 1972, 16mm, color, b/w, 15 min. German with English subtitles. Italy/France 2000, 35mm, color, 123 min. Italian with English subtitles. Italy 1985, digital video, color, b/w, 41 min. English, German & Italian with English subtitles. Directed by Daniele Huillet and Jean-Marie Straub. Wth Angela Nugara, Vittorio Vigneri, Grazi Orsi. Italy/France 2005, 35mm, color, 68 min. Italian with English subtitles. Directed by Jean-Marie Straub. With Arnaud Dommerc, Jubarite Semaran, Giles Pandei. France 2007, 35mm, b/w, 40 min. French with English subtitles. West Germany/France 1986, 35mm, color, 132 min. German with English subtitles. Italy 1998, 35mm, b/w, 66 min. Italian with English subtitles. France/Portugal 2001, 35mm, b/w & color, 104 min. Italian, French with English subtitles. Straub-Huillet A Visit to the Louvre followed by Cézanne. 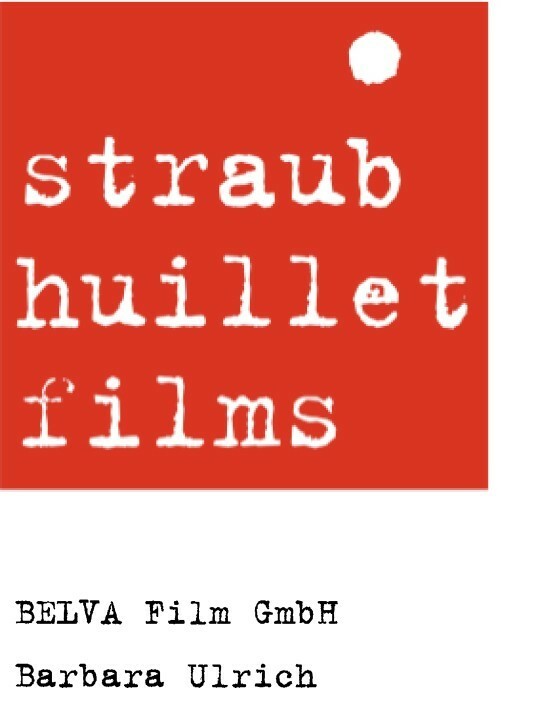 Straub-Huillet From Today Until Tomorrow followed by Sicilia! Straub-Huillet En rachâchant followed by Lothringen! Straub-Huillet Communists followed by The Algerian War!